Unfortunately, the discovery of this species generated such excitement that many of the wild populations in Peru were rapidly decimated by illegal collection. 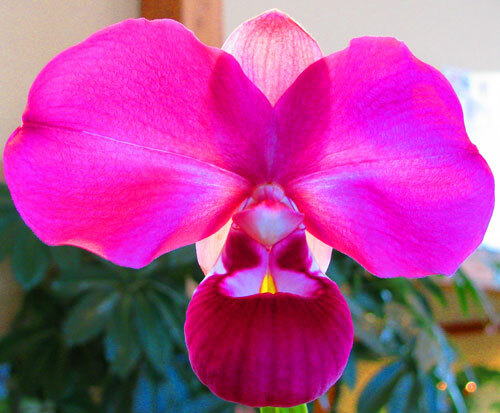 Please make sure you only buy legally propagated orchids so they don't go extinct in the wild. In their native cloud-forest habitats, it rains almost every day and humidity is high, about 70% most of the time. Water them daily or even set them in a dish filled with water. Fertilize regularly at low concentrations. They are most comfortable at cool-to-intermediate temperatures, 65-75°F (18-25C) during the day with a 10-15°F drop at night (6-8C). They like a potting mix that is neutral to slightly alkaline. Fine fir bark with a small amount of crushed seashells is appropriate. I've also read that diatomaceous earth works well, with a similar particle size. Provide intermediate light, about 2000 footcandles. More than Phalaenopsis lighting but less than Cattleya lighting. In other words, bright but filtered sunlight, such as a bright east window or a slightly-shaded south window in the northern hemisphere.